Femoral nerve and its relevance to chiropractic practice is the topic. Femoral nerve and its relevance to upper leg pain is the topic under discussion. This is not a highly academic dissertation on neuroanatomy but rather how the mid and upper lumbar spine relates to chiropractic practice. The upper lumbar plexus supplies five major nerves and some smaller ones, all of which overlap giving off little branches which connect with each other, making the precise diagnosis of the pain patterns difficult. Fortunately, in chiropractic practice, it's not usually necessary to make a decision whether the entrapment is of the the ilio inguinal or hypogastric, for example. Medicine does it by injecting blocks to determine the level. The spinal adjustment is determined by the spinal segment involved, rather than the particular fibre. For example, the L2 root could affect three different nerves, not to mention the posterior primary rami. Determining the level to manipulate is not usually simple; it's based on motion palpation, referral pattern, tenderness, reflex and dermatomal changes as well as any scans if they are available. Having decided the second lumbar vertebra is the spoke in the wheel, it's not critical to the chiropractor whether the genitofemoral, lateral cutaneous or ilioinguinal nerves are involved. What is vital is knowing that the lateral femoral cutaneous is a sensory nerve and would not affect the quadriceps muscle; also one would need to work in the groin where it is often secondarily entrapped. However, the femoral nerve is also motor and certainly can and does affect the quadriceps reflex and muscle. Upper leg pain is a very common complaint in the chiropractic clinic; sometimes it's a femoral nerve condition. Upper leg pain can be a diagnostic nightmare. Is it a nerve impingement, and is it coming from the superior cluneal nerves, the lateral femoral cutaneous nerve or the femoral nerve and is it being pinched in the spine, psoas muscle or under the inguinal ligament? Or is it a hip condition, perhaps one of the impingement syndromes like FAIS? Or is it primarily a muscular condition perhaps after an athletic injury or trauma? Or something medical like swollen lymph glands or an inguinal hernia? Femoral nerve supply from L2 L3 L4 is to the lateral and anterior thigh and groin and sometimes the inner lower leg and top of the foot. The femoral nerve is the first of two large nerves that supply the leg, the other being the sciatic nerve; entrapments of either are extremely painful. The femoral nerve emerges from the mid to upper lumbar spine, whereas a sciatica originates from the lower back. Both course down just in front of the spine, through the pelvis, but the sciatic nerve emerges through the greater sciatic foramen, passing into the buttock and the back of the thigh and calf, and the outer side of the lower leg and the foot. Sensory innervation to the skin of the upper anterior t, the lower inner thigh, the knee joint and the inner lower leg. Motor supply to the quadriceps and iliopsoas muscles. The patellar tendon reflex gives an important measure of the integrity of the femoral nerve. The femoral nerve is very long, stretching from the mid to upper lumbar spine L2 to L4, to the foot and can be trapped and injured anywhere along its course. Because it is a mixed nerve, injury to the femoral nerve can cause both sensory disturbance, including pain, and motor weakness of the quadriceps and ilio psoas muscle. Consequently, a marked limp is a feature of the condition. Stairs may become difficult and dangerous. That altered gait upsets the kinetic chain causing other problems; perhaps disturbing the balance mechanism in the inner ear, or provoking an otherwise silent hip arthritis or capsulities and other seemingly unrelated conditions. Asides from the chiropractic coalface aren't scientific but they are interesting; diabetes has a predilection for the quadriceps muscle. Remembering that approximately half of diabetics are walking the streets undiagnosed, non painful weakness of the quadriceps muscle, particularly if associated with the typical diabetes symptoms of thirst, weight loss and inability to gain an erection, always calls for a blood sugar test. More typically the femoral nerve patient presents with pain around the buttock, front or side of the thigh, around the knee, and sometimes down the inner lower leg. There is often sensory disturbance; early on increased sensation, but later numbness and, in more serious cases, loss of the knee jerk reflex and weakness of hip flexion and knee extension. The knee gives way when walking and stairs become difficult. Weakness of the quadriceps and iliopsoas causes a marked limp. Both a slipped disc in the mid lumbar region, and a facet syndrome may cause severe back pain and radiating pain to the anterior thigh and sometimes lower inner leg. I have experienced this personally; there was severe pain on the side of the hip with numbness on the inner, lower knee. When the quadriceps muscle is affected, you may find that the knee gives or buckles. People may remark that you are limping badly. Your chiropractor will find a diminished or absent knee jerk reflex. You can yourself test the muscles in the leg by following the simple instructions in the above video. Notice the blue, sensory and red, motor, nerves to the quadriceps muscle. Abdominal abscess, tumours, trauma and medical procedures and other. 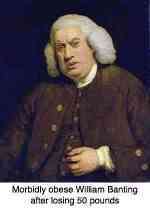 Iatrogenic Illness; doctor caused disease. Very occasionally, an abscess, such as in tuberculosis, abdominal tumours and a sudden bleed by patients on anticoagulants may physically press on the femoral nerve causing pain and weakness in the thigh. An aside which is of some importance; always there's a trade off between the benefits of treatment, and that includes chiropractic help, and the potential noxious side effects. Today I heard that a patient aged 83 couldn't come for treatment; anti coagultant therapy caused a nosebleed so bad that she's been hospitalised. And last month a very special favourite patient, yes, all doctors have favourites, went in for routine laser treatment for an eye condition. The surgeon didn't ask what drugs she was on; the anti coagulants for a minor heart condition caused a bleed behind the retina, and now she's permanently blind in one eye. She's only 55 years old. Needle puncture procedures, abdominal and inguinal surgery, total hip replacement, harvesting of bone chips from the ilium, a difficult childbirth, pelvic fractures, cancer radiation and other trauma to the groin, knife wounds, for example, and pelvis and upper leg all can occasionally injure the f. nerve. Obviously patients with a gunshot wound will not present at a chiropractic clinic, but through the years I have had patients with a femoral neuritis caused by diabetes, after pelvic surgery, after total hip replacement, after radiation to the bladder, as well as the typical lower back conditions that can and do cause pain and weakness in the distribution of this nerve. Clearly, a thorough case history and examination is vital in all cases of groin and anterior thigh pain. Hip arthritis too, also typically causes groin pain radiating down the anterior leg to the knee, but with very different signs so that the astute clinician would have no difficulty making the differential diagnosis. Of 455 patient treated surgically for lower back and leg pain, 10 percent were found to have syndromes affecting the femoral nerve, and 90 percent the sciatic nerve. Ask any chiropractor; nine out of ten cases involve the lower two discs and the sciatic nerve. Herein lies a danger; the mid an upper lumbar spine is often overlooked as a cause of leg pain. Interestingly, those with femoral conditions were on average more than ten years older than the sciatic nerve group. What's the reason? The femoral nerve group, the older patients, had lesions of the facet joint associated with aging and arthritis, rather than disc injuries, which were more common in the younger sciatic nerve group. 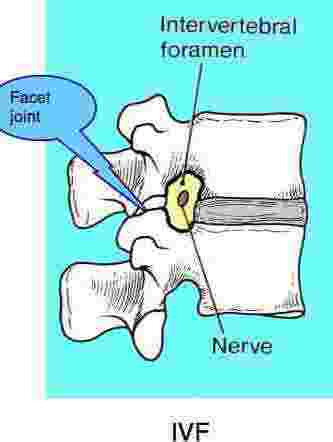 Notice that the foramen from which the nerve emerges is bounded anteriorally by the disc on the right and the facet joint posteriorally, left. Both disc and facets can impinge on the nerve roots. Femoral nerve damage with extrusion of the disc into the foramen. But first we had to face the question how reliable are X-rays? Not very in comparison with scans. Poorly managed will result in arthritis in lower back. "The higher level of the lesion the greater the incidence of apophyseal (facet) joint arthritis which may be associated with the aging process." "The femoral distribution of pain may lead to difficulties in differential diagnosis between a spinal origin and a hip or knee origin of the problem." Hip conditions too typically cause pain in the groin radiating towards the knee. "Radiculopathy causing femoral pain may be the result of both disk degeneration with protrusion and apophyseal (facet) arthritis with synovitis." A meniscus-type entrapment. "The syndrome of low back pain with femoral neuritis is NOT UNCOMMON five or more years after an otherwise successful L4-L5-S1, two-level spine fusion." Point number 4 above is vital for the Chiropractic physician. A facet syndrome at L3-L4 will affect the L4 nerve root, but the not uncommon far lateral disc lesion at L3-L4 may cause a L3 radiation. Successful treatment is predicated on making the correct diagnosis and treating the correct level. Chiropractic help must be based on a good understanding of the anatomy and neurology of the femoral nerve. Like Carpal tunnel Syndrome, Femoral-nerve neuritis is frequently a "double-crush" syndrome, with the nerve being irritated both in the lumbar spine AND the groin, usually distal to the inguinal ligament. Successful outcomes may be dependent on BOTH sites of impingement being addressed. In short, is your chiropractor also busy in the groin/ upper thigh? Meralgia Paresthetica is a neuritis affecting the purely sensory lateral femoral cutaneous nerve, again with an impingement in the upper lumbar spine and the groin. It responds well to chiropractic help that is directed at both the spine and the groin where this branch of the femoral nerve is affected. The quadriceps muscle and the knee jerk are not affected; they are controlled by the femoral nerve. 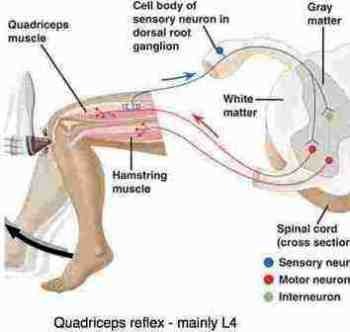 The numbness, tingling or pain is down the side of the upper leg, and sometimes in the groin too but no motor weakness. The ilioinguinal nerve supplies in the female the labia and the medial upper thigh and groin; in the male the scrotum and allied region. A facet injury at the thoraco lumbar junction can cause pain in the groin and scrotal areas, as well as a Maigne's syndrome. Once again, addressing both the spinal lesion and an entrapment in the groin as the ilio inguinal nerve passes into the inguinal canal may be important. Treatment should be limited to a maximum of three sweeps across the adductor, hip flexor muscles and the capsule. It's extremely painful, and may leave bruising. Care must be taken when crossing the femoral artery. 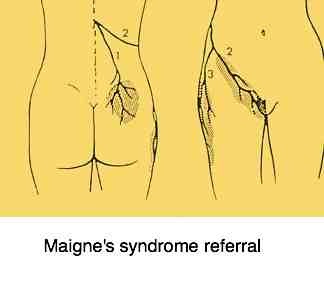 Maigne's syndrome is a poorly understood condition of pain radiating from the thoraco-lumbar region along the superior cluneal nerves to the buttock and perhaps according to some authorities the groin. The femoral nerve directly is not affected. Every day there is an interesting Femoral nerve casefile walking into the clinic. Lower back and leg pain, upper leg pain, groin pain, Maigne's syndrome, Meralgia paresthetica; you name it, every day they present at the Chiropractic Coalface. Do you have a question about leg pain? Share it! Please do not write on a smartphone; I will not answer. I have tired of correcting not so smart grammar. Your story will appear on a Web page exactly the way you enter it here. The more details about precisely where the pain or tingling is, what increases and relieves it, whether you also have back pain, other treatment you've had, X-ray reports, the more I can help you. Pretty please, others are going to read this, in decent English not mobile gobbledygook. TIP: Since most people scan Web pages, just as you have been doing, include your central thoughts in your first paragraph. Do you have some pictures X-rays to add? Great! Click the button and find it on your computer. Select it and click on the button to choose it. X-rays can be put up on viewing box, and photographed with a digi camera. Conversion of digital scans too though that's a little more difficult. LBP with upper thigh pain from WHAT TYPE OF Femoral Nerve damage? Lower back and right groin pain. Trapped femoral nerve? Thigh pain after walking (Femoral nerve trapped? Acute knee trauma patients are not uncommon in sports oriented chiropractic clinics. The femoral nerve supplies the large muscles and structures around the knee. Acute knee trauma invariably causes what is known as arthrogenic inhibition; trauma to the knee inhibits the motor part of the femoral nerve that innervates the quadriceps muscle, causing further complications. Chiropractic Help » Femoral nerve.